Are Averaged Google Organic Search Click Through Rates Useful?. Understanding your site’s click through rates — how many searchers click your site’s listing when seeing it in search results – can be key to SEO. 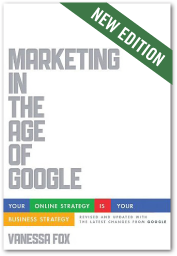 But are web-wide or industry average click through rates useful? We analyzed 4,896,866 keywords from April 2015 to see what we could find out about branded vs. non-branded searches, industry differences, and averages vs. site-specific metrics. 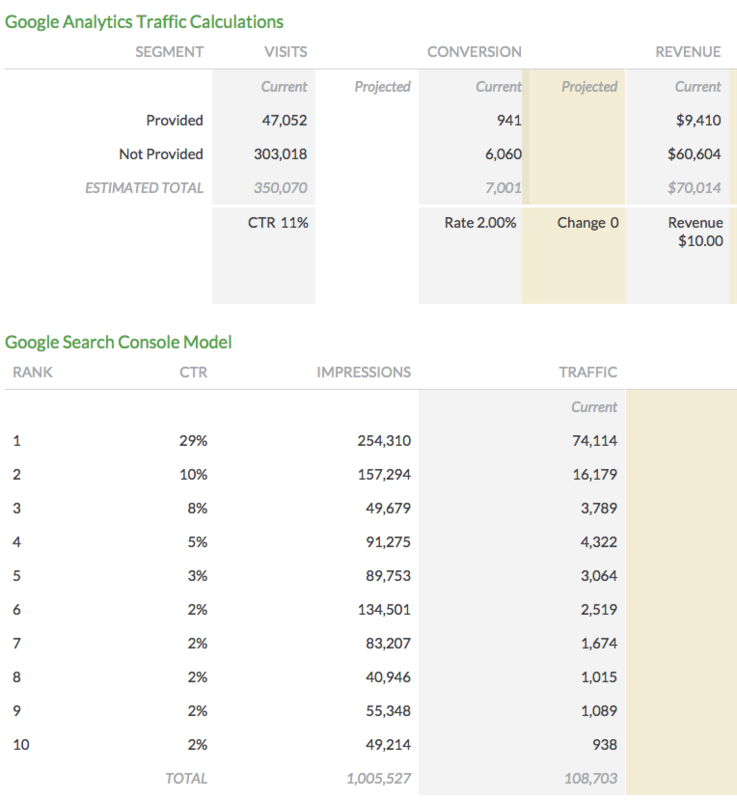 tracking CTR for branded and non-branded searches separately (searches for your brand almost always have higher click through rates). comparing CTR for logical topic areas and monitoring CTR trends (especially as the search results page changes for different query types due to Google’s varying use of Oneboxes and the like). We analyzed 4,896,866 keywords from April 2015 and segmented those keywords by topic. Keylime Toolbox data is sourced from Google Search Console so these metrics are based on Google’s query logs. The click through rate is calculated as the percentage of the total reported clicks divided by total reported impressions. 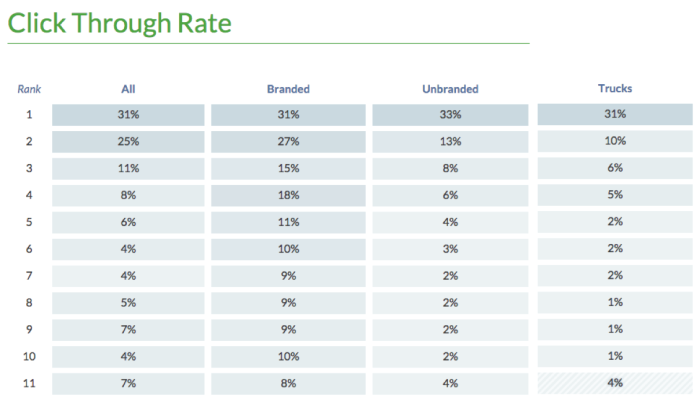 Typically, we find that click through rates for branded searches can be significantly higher than those for unbranded searches (which makes sense since those specifically seeking you out are more likely to click on your listing, regardless of ranking position). When using this data to forecast market opportunity, for instance, it’s best to use CTR from unbranded searches to get a more accurate approximation. Click through rate averages aren’t very useful for applying to specific situations. The specific CTR rates for a site may vary wildly from the industry averages but stay fairly constant over time for that particular site. This makes sense. Some brands are stronger than others, so when searchers see them in results, they’re more likely to click. Some sites do better at creating compelling listings displays with rich snippets, great titles and descriptions, and so on. The number one ranking definitely doesn’t always get the click. In general, the higher the ranking, the higher the click through rate, but nearly all of segments we analyzed had click through rates of less than 50% at the number one position. Of course, many specific queries within each segment had much higher click through rates, but high ranking doesn’t guarantee a click (both because the searcher might be clicking on ads or Oneboxes, and because lower results might be more compelling). Site A had an average click through rate of 24% for fashion-related unbranded searches. The query from the set that ranked #1 that brought the most traffic had a click through rate of 25%. Looking at the search results for that query, which has commercial intent (the searcher is looking to buy clothing), the shopping Onebox is at the top of the page, followed by two ads. So it’s not surprising that the top organic result only received 25% of the clicks (and that the overall average is even lower). 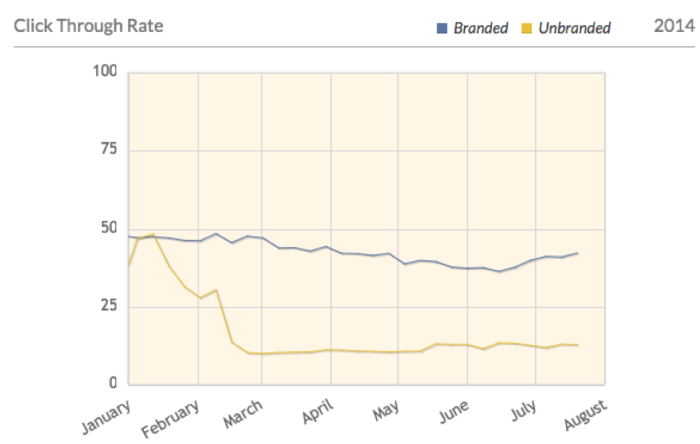 If you’re curious as to what we found when looking at average click through rates by topic, here’s the data for both branded and unbranded searches. This data is for a single month, so does not reflect seasonal changes. This data is world wide. The CTR is aggregated into whole-number ranking. However, Google Search Console reports average rank as a single-digit decimal. We rounded rankings (1.0 to 1.4 is rounded to 1; 1.5 to 2.4 is rounded to 2, etc.). Keylime Toolbox can aggregate query data in any way you’d like and show averaged click through rates for each segment, as well as trends over time. It then uses that data in ROI calculations for improved ranking impact and provides data that you can use for calculating market opportunity. The Keylime Toolbox Click Through Rate charts show averaged CTR by position for each segment you define (in addition to branded and unbranded segmentation). You can view this data for any date range (day, week, month, or year) and can view trends over time. 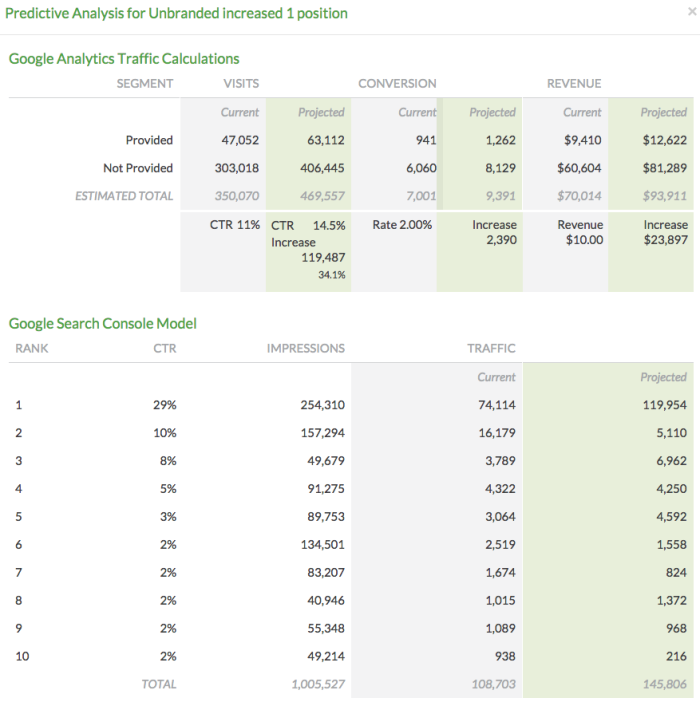 Keylime Toolbox also includes a Market Opportunity Forecast that uses your site’s custom click through rate date to calculate the increased traffic your site would get from improved rankings. You can view CTR rate data averaged across all ranking positions for each query segment or at each ranking position by segment (for any date range). This enables you to get a sense of how searchers are interacting with your site’s listings on the results page and compare topic areas. If your site’s traffic from Google organic search has declined, you might immediately assume a ranking issue and start investigating potential penalties and other things that might hurt rankings. But maybe Google has changed the search results page and now your site’s number one ranking is below the fold. Or maybe your site had a technical glitch and lost all page titles and descriptions. Keylime Toolbox can show you where to look first with just a click. The graph below shows what happened to the click through rate for a set of unbranded, local queries ranking at number one for a particular site. All of these queries continued to rank in the first position, but fewer searchers were clicking on those listings. From this data, Keylime Toolbox calculates the estimated impact of rankings increases or decreases. You can use your site’s averaged click through rates when doing keyword research and gap analysis. Once you have a set of keyword research, download the query data for your site (matching the duration of time from the keyword research; if you’re using Google Ad Planner, for instance, you would download a month of data) for that same topic area using the Keylime Toolbox Custom Segmentation Tool. You can then use a VLOOKUP in Excel to see which queries your site doesn’t get Google organic traffic from. The search volume from those “gap” queries is total market size, but isn’t the market opportunity for your site, since you won’t receive 100% of clicks even if you rank for every term. Multiply the search volume of the gap queries by the average click through rate (12% in the above example) for the potential market opportunity of those queries. What About Your Site’s Personalized Click Through Rates? Find Out With a Free Keylime Toolbox Trial! Want to check out your own site’s data? Set up a free trial of Keylime Toolbox Complete Edition. Follow the easy checklist to integrate Google Search Console and Google Analytics data and you’ll have useful, accurate click through rates for your site in just a few clicks. I’m finding some high ranking, high impression keywords/pages with unusually low click through rates. It seems these correlate with search results that include images or sitelinks from the site I’m analyzing. Do you see this sort of thing and agree that such cases are indicative of a non-traditional result type? good analysis about the metrics. Hi, any plans in the works for an update on this data for this year?